‘Inspired by a hanging disco ball reflecting and redirecting the early morning sunshine inside, ‘Dapple light’ tries to recreate this impact. 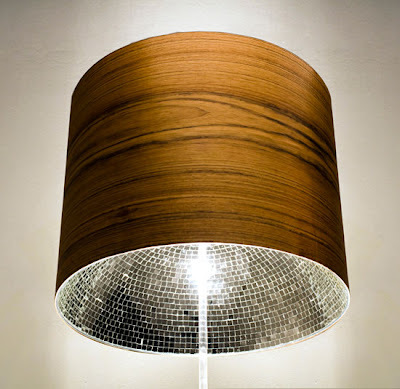 When lit, mottled light bursts out of the seemingly regular wood veneer shade. But hidden from view, small glass mirrors line the inside of an Ovangkol veneer shade. Most effective in a darkened space, ‘Dapple light’ swathe the surrounding area with an explosion of light. " Dinosaur L was a band produced and directed by Russell. In 1978, they released "Kiss Me Again", one of the first disco singles released on Sire records. The opening gambit was unambiguous, even by meat-market standards: "I want you inside me/ Yes, that is the plan." But this was Russell: trenchant and immediate, but with manners to his syntax. He was a peacenik. He wrote a song called "You Can Make Me Feel Bad"; he wrote about going swimming and treehouses-- a city youth lusting for country peace-- and once quipped that "grown-ups are crazy." The poet Allen Ginsberg, who Russell accompanied on cello for some readings, remembered the singer as saying he wanted to make "Buddhist bubblegum music." "Arthur's first "dance" record was "Kiss Me Again" recorded in 1978 for Sire using the monicker Dinosaur. He co-produced it with Nicky Siano, with David Byrne adding some enjoyable guitar licks. Steve D'Aquisto remembers hearing the original version on a tape. "Arthur would give me tapes, pieces of "Kiss Me Again". I went to Studio 54, and it was like 10.30 in the evening, there were just a few people in the place. I said to the DJ, a friend, "Would you play this, I think it's just fabulous" and they played this 12 minute tape of "Kiss Me Again" and the place flipped and danced for the entire bit."